Mostly I think that traveling with the kids is great. They experience the world in a whole different way, which gives a completely different travel experience. On our last visit to a medieval village, JM and I were looking at this interesting church which was half really old and half super-duper-amazingly-incredibly old. 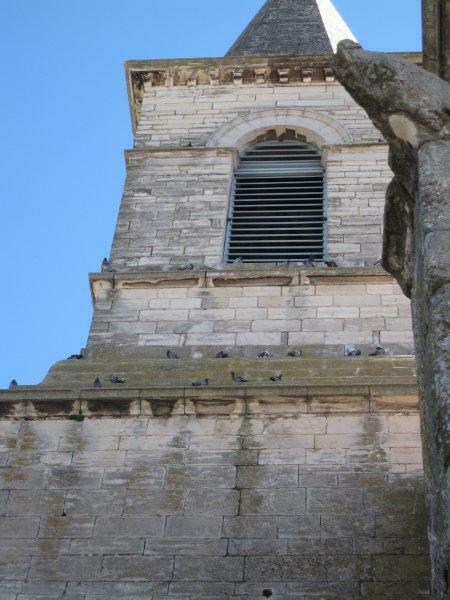 Meanwhile the girls were completely fascinated by the pigeons living in the church steeple. It was fun to watch them watch the pigeons. Church or pigeons? Depends how old you are. When we first arrived we rented a car at the Lyon airport that was big enough for all our year-away luggage – and it was expensive. 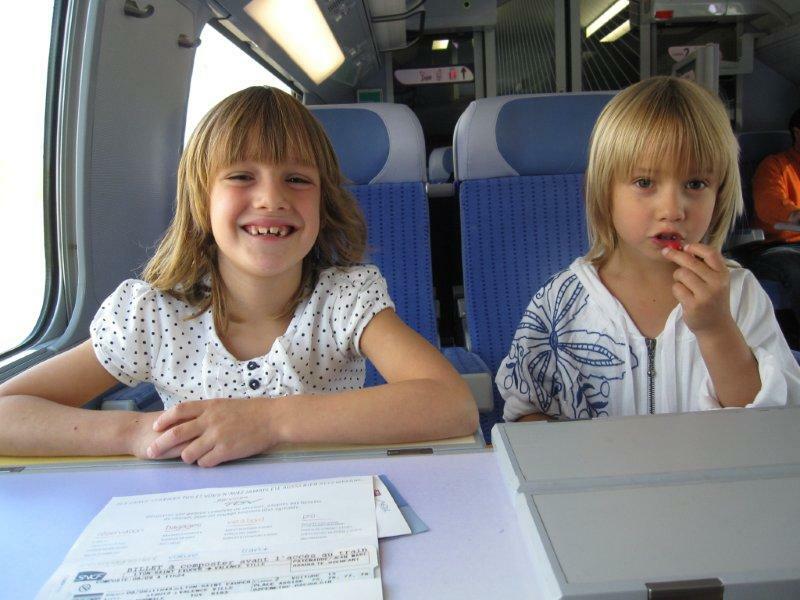 Once we were settled we decided to do a quick trip to return that car to Lyon, then take the train back to Valence where we could rent a smaller, cheaper car until we could buy something. The girls LOVE trains. This would be a fun family outing. We grabbed the girl’s doudous (stuffed animals) and the DSes and headed out. There was a TGV (French high-speed train) leaving Lyon at 11:30, so we left at 8:30 to give ourselves extra time. Fun day with trains and kids, here we come. 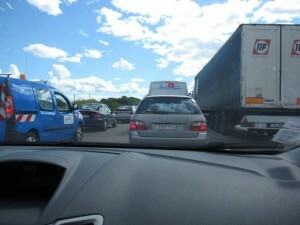 We did hit a bit of traffic on the way to Lyon, so used up the extra time, but were still in good shape. But then the vomiting began. We immediately formed a new electronics rule – NO DSes IN THE CAR! Vomiting when you have a barf bag is really no big deal. You fold up the bag, toss it, wash your face (brush if you’re lucky) and almost nobody notices. Vomiting without a barf bag a VERY different matter. So I always travel with a barf bag. But not that day. That day I didn’t have the barf bag. Didn’t have a change of clothes. Didn’t have any rags, paper towels or Kleenex. Didn’t even have a bottle of water. I just had a pukey child with pukey clothes in a pukey booster seat with a pukey doudou. 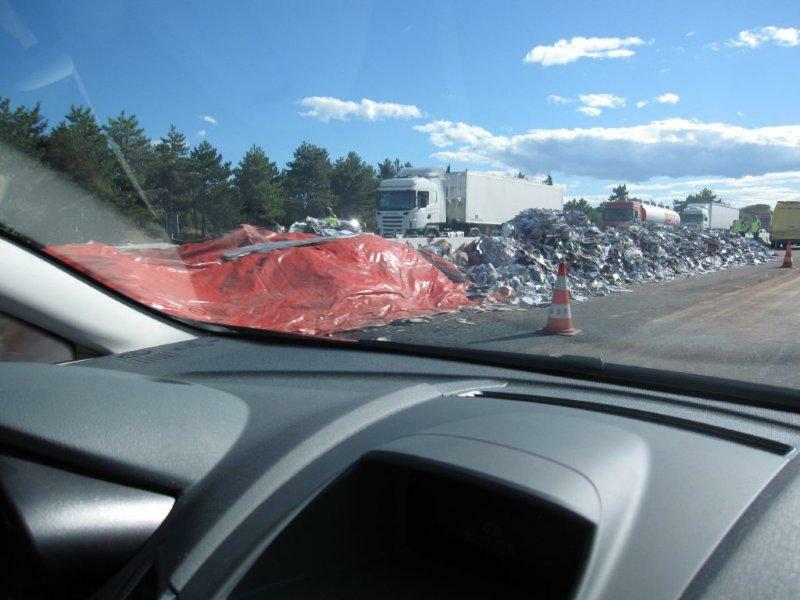 We got most of the mess cleaned up – enough to keep going to the airport. I put Z in my sweater which was a sort-of dress for her, put all the vomitty stuff in the backpack, and we made it to the train just in time. JM had arranged to pick up the new rental car at the “Valence TGV station”. We got to Valence and grabbed lunch, then found the Avis counter at the train station to pick up the car. 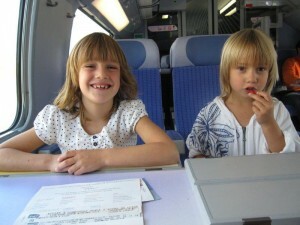 But apparently the TGV we were on didn’t go to the Valence TGV station, it went to the Valence Ville station. We had to grab another train – leaving in 2 minutes of course, so we had to rush the girls through another train station – to get to where our rental car actually was. We finally got the new rental car and were less than an hour away from the house. Then we hit THE TRAFFIC JAM. It took us two hours to travel 10 kms (6 miles)!!! And remember that new NO DSes IN THE CAR RULE? It didn’t last for more than 3 hours. The kids needed something to keep them busy while we sat on the road doing absolutely nothing viagra chez pfizer. Traffic Jam on the A7. It turned out a paper truck had turned over on the freeway. Paper that caused the traffic jam – cleaned up by the time we drove by. We did get home that day – very late, very hungry, and very smelly. We will get better at this. To start, the car now has a stock of barf bags ready to go for next time. I’m entranced by how blue the sky looks in all your pictures. Sorry about the puke and the traffic and everything, but can the sky really be that blue? Lucky you.